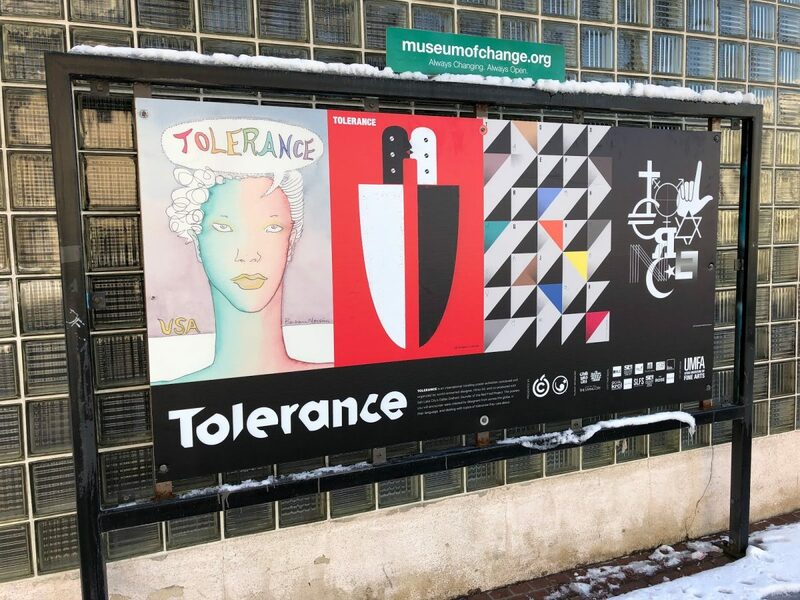 Tolerance posters on the Museum of Change billboards. Tolerance, a worldwide touring poster exhibition, has made its way to Salt Lake City. This project, devised by New York-based Bosnian comics artist Mirko Ilić, explores and brings together various interpretations and understandings of what tolerance is through graphic art. Having opened in Slovenia in 2017, the project has been exhibited widely, with appearances in Madrid, Lebanon, Finland, and now Utah. This show first appeared on Salt Lake City’s streets in early January and slowly has spread throughout the city in various spaces. 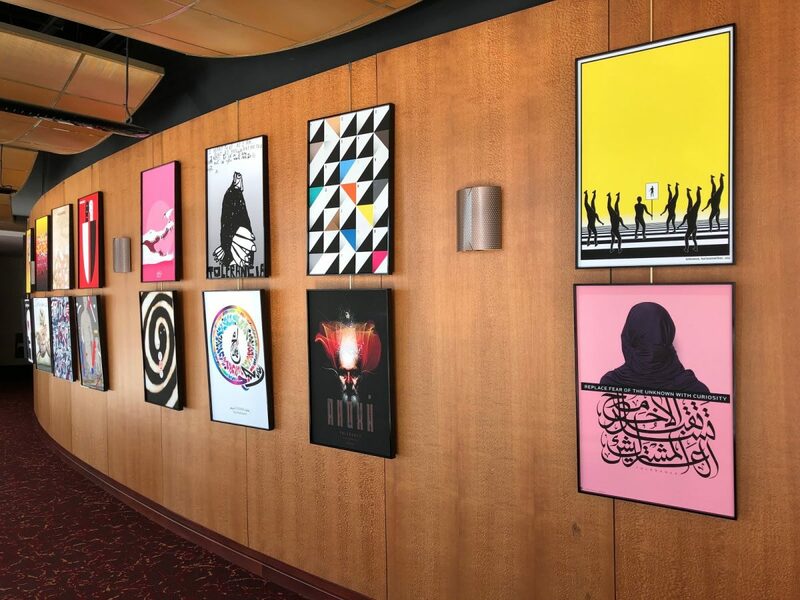 Salt Lake City had the unique opportunity to bring this show to a broad audience during the Sundance Film Festival, where visitors from around the world saw the Tolerance posters at Salt Lake Film Society and in the lobby of Rose Wagner Performing Arts Center. The visuals that constitute Tolerance are the creations of an amalgam of designers from around the globe. Tolerance began when the city of Ljubljana, Slovenia, offered Ilić a small city square to stage an exhibition during a film festival called “House of Tolerance.” He asked 24 world-renowned artists to create work for the exhibition with one unifying feature: they should write “tolerance” in their native language somewhere on the work. This simple set of instructions created more than 100 posters, and incorporates intersections of gender, sexuality, and race to speak to communities at large. As various identities and cultures are present among them, the artists are the real crux of the exhibition. When viewing the exhibition with the knowledge of their identities, the message of “tolerance” becomes explicit. Rather than being seen as an inventory of global art, Tolerance is an earnest judgment of whatever community it resides in — all to give purpose to the “other” through the eyes of the viewer. 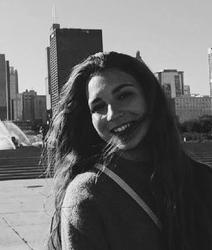 It is not only a reminder of the intersecting identities in our community, but a reflection and subversion of the past, to evoke a stronger lobby for a more tolerant future. This is just one way in which art can help communities work toward a more equitable city, nation, and world. The exhibit’s aim is to spread this idea of benevolence to as many people as possible while being resourceful and practical about the spaces in which the posters are shown. In order to accomplish this goal and reach a broad audience, the project is focused on the streets and other public spaces instead of traditional museum and gallery locations. In Salt Lake City, iterations of the project can be found at Pioneer Park, on the Museum of Change’s pedestrian-friendly billboards that run along Third South, and as projections on the outside of The City Library. 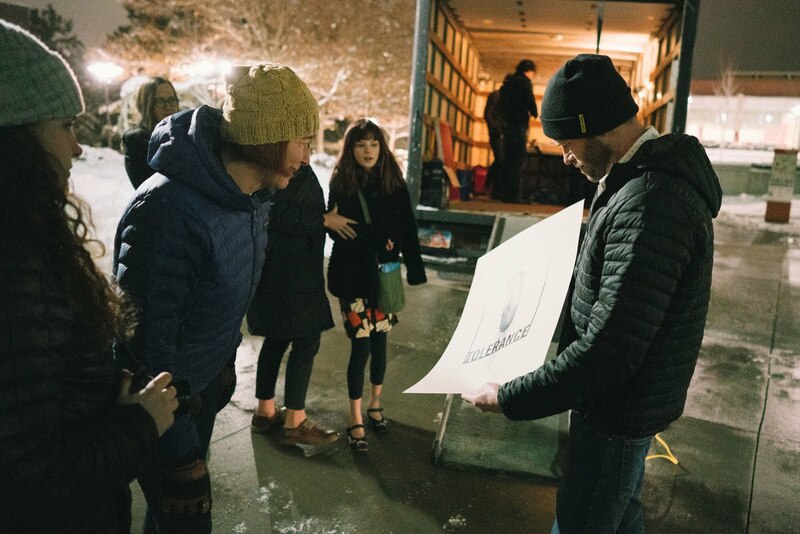 THE BLOCKS, Salt Lake City’s Cultural Core program, is bringing the exhibition and screen-printing experiences to a variety of pop-up venues with their mobile art truck; and posters can be found indoors at the Salt Lake Film Society and Rose Wagner. While this traveling exhibition has traditionally avoided museum and gallery spaces, the UMFA has taken part and curated 20 posters for the fourth ACME Lab, The International Tolerance Project: Promoting Dialogue Through Design, which will run through June. The “Tolerance” Posters Project continues in Salt Lake City through April 8. To keep up with the project, visit http://toleranceposters.blogspot.com/.